As a new report reveals hate crimes on the rise nationwide after Donald Trump’s election as president, a deep racial divide continues to exist in parts of the Texas region among different ethnic groups. 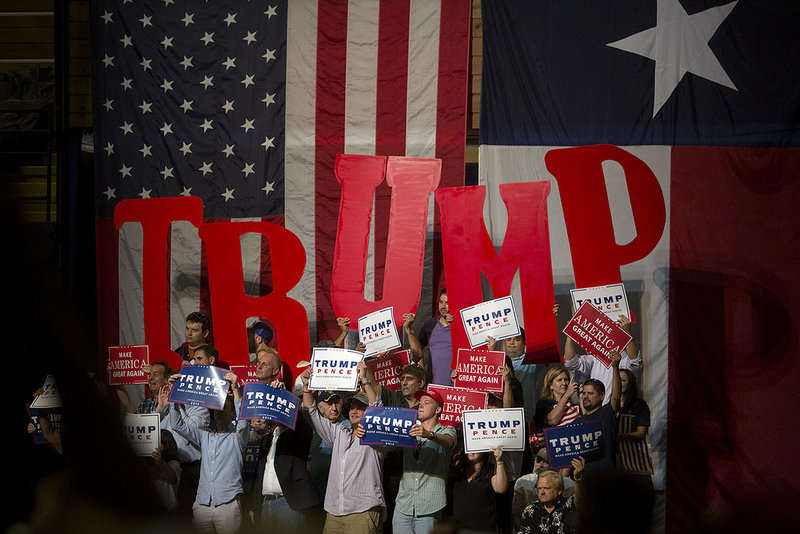 Trump supporters inside the Travis County Expo Center on August 23, 2016. Since the election of Donald Trump as President, the Southern Poverty Law Center says nearly 900 hate incidents have been reported across the country. These incidents have ranged from instances of violence and intimidation to messages of hate through graffiti and verbal abuse. So with Houston being the largest city in the state, we decided to ask several residents – both Black and White – what parts of Houston or areas within the Texas region that they’d be cautious in driving through to avoid harassment. One African-American, F.N. Williams, says he avoids Texas towns like Vidor and Jasper. He says segregation continues to run rampant in those areas east of Houston. Mark Potok is Senior Fellow at the Law Center. “The vast majority of hate groups, especially Klan groups, are concentrated in East Texas,” says Potok. His organization has done extensive research in mapping out where certain hate groups, like the Ku Klux Klan, are predominantly located. According to the Law Center’s website, there are 84 active hate groups in Texas – the most of any state in the country. Meanwhile, Houston resident, Louise Elizabeth Eriksen, who’s Caucasian, says she’s felt unsafe driving through the Acres Homes neighborhood located in the northwest section of the city. Acres Homes has a population that’s majority Black. Both Williams and Eriksen are part of discussion panels featured in an upcoming Houston Public Media TV special entitled, “Houston in Black & White,” a one-hour presentation slated to air in January. The TV broadcast is part of our year-long initiative called, DiverseCity, which examines how racial divides impact the nation’s fourth largest city.